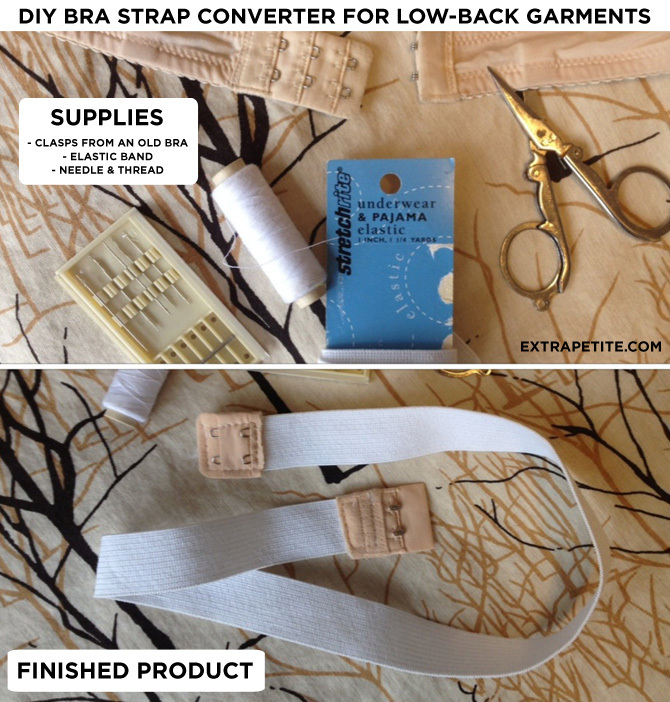 If you’ve ever passed on a low-back top or dress due to qualms about what bra to wear, here’s a quick DIY project that might nix such qualms in the future. After posting about a few holiday dresses this season, several readers (thank you all!) informed me about a low-back bra converter. It’s very affordable to buy, but not always easy to find right when you need it. 1) Snip off the clasps from an old bra, making sure to leave enough “band” on to attach to the elastic. Bra clasps for the most part are universally sized, but do test out the clasps on the bra you plan on wearing just to be sure. 2) Sew one clasp to the end of an elastic band. Make sure you sew it on securely because there will be tension pulling on the band. 3) Clasp it on one end of your bra, and wrap around your tummy to measure the length you need. You want it to be taut so that the tension pulls the back of bra band down low enough, but not so tight that you’re uncomfortable. Cut your elastic to the length you need, then sew on the second clasp. Voila! This will not work on completely back-less items, but is adjustable enough to work on a range of lower-dipping backs. A few of you have asked how the Zara sequin dress in XS worked out, so here is a belated update. There was once a time when I’d go for the tightest fit possible, but that time has long passed. The XS will work nicely for some, but on me, it was very snug and less flattering than the small. For reference, I’m about 5ft tall and 32-24-32. I did find the waist on the S to be slightly loose, and altered it last minute by making a small incision along the inner lining. There’s a zipper along one side of the torso (which I didn’t want to touch), so I took in the other side by about an inch, right at the waist line. The amount was small enough to not make the dress too lopsided, but enough to make a little difference in the overall silhouette. Photos above are post- DIY alteration. Readers – Please share your favorite undergarment solutions for tricky clothing designs! I just came across your blog today and am so excited!!! I'm extra petite also, and feel like I've found a kindred spirit 😉 Thank! Amazing DIY! I always need help with this! Love your idea, very creative. Nice! Thanks for diy! And the dress looks amazing on you. Jean, I was wondering if you had some tips about shrinking 100% cotton items (like a simple t-shirt)? I know you mention shrinking using the washer/dryer at times, but any specific directions/tips would be super appreciated! This has been really helpful. I've got a dress which I bought years ago, still unworn because I have no idea how NOT to get the bra straps showing on the back. Brilliant idea. And very frugal too. Thank you so much for showing this. love your tip with the bra…you really know how to make cloths feet your body…congrats! I just purchased the sequin dress in xs it was on sale online. I tried both the xs and s on. I maybe a tad bit smaller than you. The small is quite loose on the chest area waist and the skirt flared a little at the bottom. Hope I didn't regret getting the xs ones 🙂 btw I purchased the dress cause It looked great on you. And I waited till it went on sale glad they still have my size. I love that you are brave enough to photo yourself with the bra on the outside of the garment. You are wonderful and so creative with your solutions. Genius, I say!!! And great reminder that even though the XS fit, the S was definitely more flattering and less hoochy. Great lil alteration you did at the waist! I have done the same thing on the SAME dress! That's a very cool idea! Will keep it in mind if I ever need to hide the strap in the back. Thanks for sharing! Thanks for sharing the bra trick…this will definitely be used soon!! Have a fabulous New Year's!! Thank you for wearing your bra on top of your dress!!! It really helps me rig up my own for all the low back dresses over the holidays. Wow. Amazing idea, i will try my old bra, thanks for sharing very useful idea. i will share with my friend. i will apply my old wonderbra . For shirts, that's what garters are for! If you're comfortable wearing thigh high hose, use garters to keep the hose up and the shirt tucked nicely. Hi! I just found this blog and fell in love. I am "extra petite" too and I love your tips! This is a great one, since I don't dare NOT wearing a bra, and I had to pass on some dresses because of the lower back and bra's showing! I love this! Glad I didn't throw out some of those old bras yet – I knew they would be good for something! Oh my word….talk about a money saver! This was a fantastic tutorial and it worked like a charm! Thanks so much! This is so helpful! do you think it would work for a strapless bra for a wedding dress though? or would it just pull the bra down? I wouldn't recommend for a strapless, because it would probably pull it down too much without the support of two shoulder straps. Hi! My dress is very very low. Will this work? Or do ineed to have the elastic longer? can you buy just bra clasps? I really want to do this but don't have a bra to spare / cut up at the moment. great tutorial! Awesome tutorial. I did perfectly and was so comfortable. I pulled the elastic down my pelvic instead of around my waist or tummy and it was much more comfortable. God bless you. Thanks.